Have you been contemplating adding commercial laundry equipment to your Orlando hotel property as an amenity for guests? If so, you will be adding a profitable investment that will not only help you increase revenue but will also increase satisfaction among people who stay at your hotel. From business clients to families, there is a wide range of clientele who are in need of commercial washers and dryers when on vacation or a business trip. And for most of these guests, they will choose a hotel property with an onsite commercial laundry facility that is safe and easily accessible, so why not offer one at your location? If outfitting and/or designing an onsite commercial laundry area is a new endeavor for you, let our skilled and experienced team help you. We have been providing card and coin operated laundry equipment to thousands of clients throughout Florida, and hotels are one of our most popular industries. By taking into consideration your budget and the environmental aspects of your Orlando hotel, our team will create a strategy and layout for your commercial laundry facility. The end result will be an efficient, comfortable, and eye-catching laundry area that hotel guests will appreciate. Orlando Commercial Laundry Equipment: Is Card or Coin Operated Better? Once you have decided you want to entice more hotel guests and increase your revenue, you will have to determine what type of commercial washers and dryers you want in your Orlando hotel property. At Commercial Laundries Orlando, we offer both card and coin operated options from top name brands such as Maytag, Speed Queen and Whirlpool. Card operated machines come with Smart Cards for guests and a Clean Pay kiosk where money is uploaded onto the Smart Card. Coin operated machinery comes with theft deterrent coin vaults, large coin holding capacity, and other benefits that make collecting coins easier for you. Typically, card operated laundry equipment is the most popular option for Orlando hotels because guests only need to upload money to a Smart Card and begin washing their clothes – no more searching for change in order to get the job done. To learn more about the benefits of each type of laundry equipment, reach out to one of our team members. Why Lease Hotel Laundry Equipment with Commercial Laundries Orlando? We know you have many options when it comes to obtaining commercial laundry equipment, but we want you to know about the benefits of leasing with an expert in the industry. At Commercial Laundries, we customize our contracts with our clients so you can reach your goals faster and get only the equipment you need to satisfy your guests. Plus, you’ll be happy to know that all of our Orlando commercial laundry equipment lease clients consistently receive service and maintenance on all of their machines free of charge. This ensures your commercial washers and dryers are working in top condition and will continue to work at peak performance for the lifetime of your lease. Plan common laundry spaces near central traffic areas or in a space that is easily located and accessible. 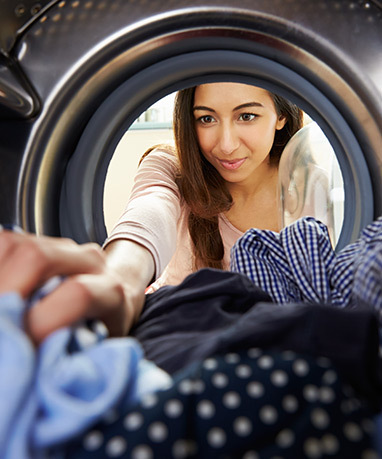 Outfitting your space with the latest technology and commercial laundry equipment not only saves you costs on water, gas, sewer and electric, but will launder your guests clothing quickly and more efficiently. Attract repeat travelers and new customers through word of mouth that your Orlando hotel property offers a clean, safe and comfortable onsite commercial laundry area. Give your guests all the more reason to leave you with a great review by offering amenities such as free Wi-Fi, televisions, games, and comfortable seating while they launder their clothing. Still need help creating a layout and strategy for your Orlando hotel commercial laundry facility? Let the experts at Commercial Laundries assist you in planning your new endeavor and outfitting it with the right card or coin operated machines you need. We look forward to working with you!